Ninh Thuận ([nɨn tʰwə̂ˀŋ]) is a province in the South Central Coast region of Vietnam (sometimes seen as part of the Southeast region). The Cham principality of Panduranga had its center in Ninh Thuận Province, but also included much of what is now Bình Thuận Province. Panduranga became the political centre of Champa after the fall of Vijaya in 1471. It remained independent until 1832, when emperor Minh Mạng annexed it. Ninh Thuận was merged into Bình Thuận Province in 1976, together with Bình Tuy Province, Ninh Thuận became a separate province again in 1991. Ninh Thuận's topography is typical for the South Central Coast in that high mountains are located not only near western border to the Central Highlands, but also near the coast, the highest of which is Chua mountain (núi Chúa) at 1040m in the north-east of the province. Several other peaks with heights up to 643m (Da Bac mountain/núi Đá Bạc in the south) are located along the coast. 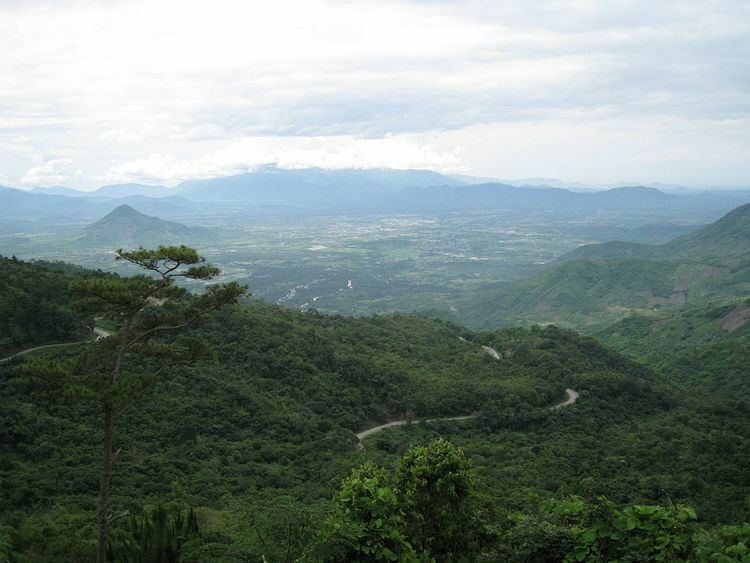 The highest mountains are located at the borders to Khánh Hòa Province and Lâm Đồng Province, with three mountains of over 1600 and the highest at 1652m (Suong Mu mountain, Núi Sương Mù). Only a small part of the province around Phan Rang has elevations of under 50m. The province's major river is Dinh River, which flows through the main lowland of the province as well as Phan Rang. It has several tributaries in the province and is connected to Don Duong Lake in Lâm Đồng Province. As of 2007, 55.7% of Ninh Thuận's area was covered by forests, making it the most forested province of the South Central Coast. Forests cover most of Ninh Hải District at the coast in the north-east, most of the north and south-west of the province. Ninh Thuận is Vietnam's most arid province, with some areas in the province receiving less than 800mm of rain per year. There are reserves of molybdenum in the north of the province. Ninh Thuận had a population of 565,700 in 2009. Its urban population was 185,700 or 32.3% in 2007, a rapid increase from the 123,700 seven years ago. The urban population grew by an average 6% from 2000 to 2007, while the rural population actually had slightly negative growth. Overall population growth averaged 1.5%, which is the second highest in the South Central Coast after Da Nang. Apart from the Kinh, significant parts of the province's population belong to the Cham and Raglai ethnic groups. Many of the Cham live near the capital Phan Rang. The Raglai live in more remote parts of the province, such as the Ninh Hải District in the north-east and the mountainous regions in the west. They are further subdivided into 3 commune-level towns (or townlets), 47 communes, and 15 wards. Cham names for Cham villages in Ninh Thuận Province are as follows (Sakaya 2014:755-756). Ninh Thuận is southern Vietnam's poorest and least industrialized province. Nominal per capita GDP was 6.66 million VND in 2007, half of the national average and 56% of the South Central Coast's average of 10.8 million VND. Ninh Thuận has also been the only province in the South Central Coast with an average annual GDP growth rate of less than 10% from 2000 to 2007 - at 9.4% compared to the region's average of 11.2%. While its industrial growth has been slightly above the region's average at 16.4%, it started from a very low base and therefore contributed little to overall growth. Growth in services has been at 9.8%, significantly below the region's average, while agriculture, forestry and fishing have grown at an average rate of 6.7%, somewhat higher than the average. Ninh Thuận's agriculture is mostly based on rice. 33,400 ha out of a total of 70,000 ha were used for the cultivation of rice, followed by maize with 14,200 ha. 173,200 t of rice and 36,300 t of maize were harvested in 2007, accounting for 0.5% and 0.9% of national output. The most important cash crop is tobacco. It is grown on 1300 ha (as of 2007) in the central part of the province west and north-east of Phan Rang with an output of 3300 t, or 10.3% of Vietnam's total output. The province also harvested 200 t in 2007, 1.2% of the national total. Other less significant crops include cashew nuts, sugar-cane, peanuts, and coconuts. Despite the large forests of the province, there is little commercial use of forest resources. Gross output of the forestry sector was 23.7 billion VND, accounting for only 1.8% of the South Central Coast, and therefore even less than Da Nang. Much of the province's forests are protected as part of Núi Chúa National Park and Phước Bình National Park. Ninh Thuận's fishing gross output was 1138.8 billion VND in 2007, 1.3% of Vietnam's output and therefore more significant in a national context than agriculture. It has grown at an average of 11.7%, far exceeding agricultural growth and making it one of the fastest growing sector's of the economy. As of 2007, there were 589 offshore fishing vessels registered in the province. Ninh Thuận has a very small industrial sector, with a gross output accounting for only 2% of the South Central Coast's total. Industry contributes 1.3 million VND to the GDP per capita, compared to an average of 4.4 million VND for the region. The province's industrial products are mostly basic processed food and seafood products (frozen aquatic products, fish sauce, shelled cashew nuts) and processed raw materials (stones, bricks, salt). However, the industrial sector's growth of 16.4% has enabled it to absorb much of Ninh Thuận's labor force growth by increasing industrial employment from 14,900 in 2000 to 43,700 in 2007 - although this employment growth has been overshadowed by the service sector, which created 57,300 additional jobs in the same period despite its slower growth. Ninh Thuận is located along Vietnam's main north-south corridors. National Route 1A as well as the North–South Railway run through the province. Ninh Thuận's main railway station is at Tháp Chàm. There are also two smaller railway station: Bà Râu in Thuận Bắc District in the north and Cà Ná near the southern border. Phan Rang is connected to Da Lat by National Road 27 via Ngoan Muc Pass. There used to be a railway serving the same route, but it has not been in use since the start of the Vietnam War. Da Nhim hydro-power plant is located in Ninh Sơn District in the northwest of Ninh Thuận. Ninh Thuận was chosen as the site for some of Vietnam's future electricity projects that are part of EVN's diversification away from hydro-power. The country's first nuclear power plant is under construction in the south of the province. A second nuclear power project is being prepared with Japanese partners and will also be in Ninh Thuận. Construction of a 200 MW wind power plant has also started and is planned to be completed by 2012.